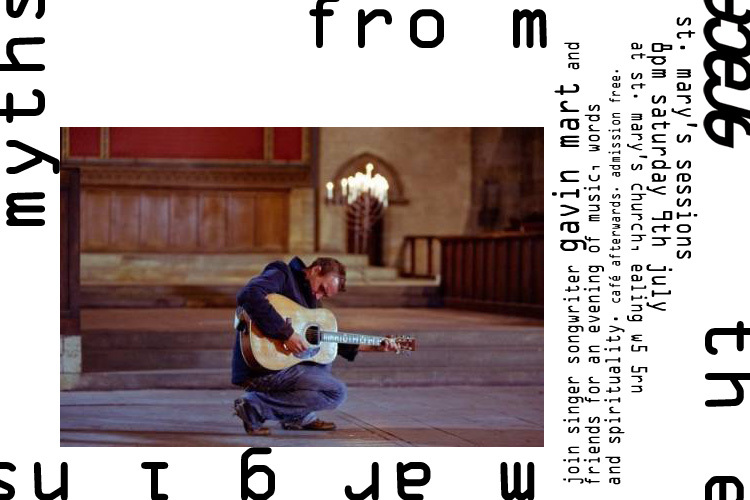 In which singer songwriter Gavin Mart and musical friends share some of their tales with us and experiences of spirituality through their music. Gavin is based in Llandudno in north Wales, where he runs an award-winning social enterprise in a brewery! 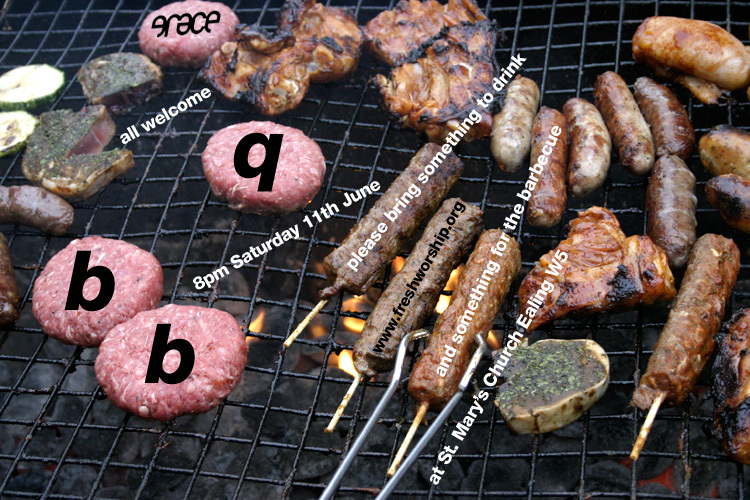 All welcome to the Grace barbecue - bring a bottle and something to cook on the barbecue. 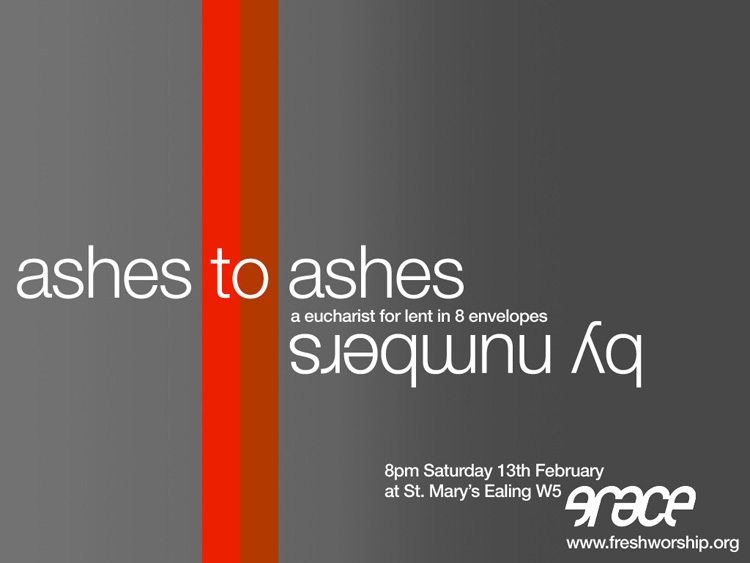 It will be helpful if you can let us know that you're coming via info@freshworship.org, so we have some idea of numbers. Come and join us at Grace as we celebrate the gift of the Spirit at Pentecost. What makes you 'light up' in spontaneous worship? How do our lives and actions 'light up' God? Who's lighting who? 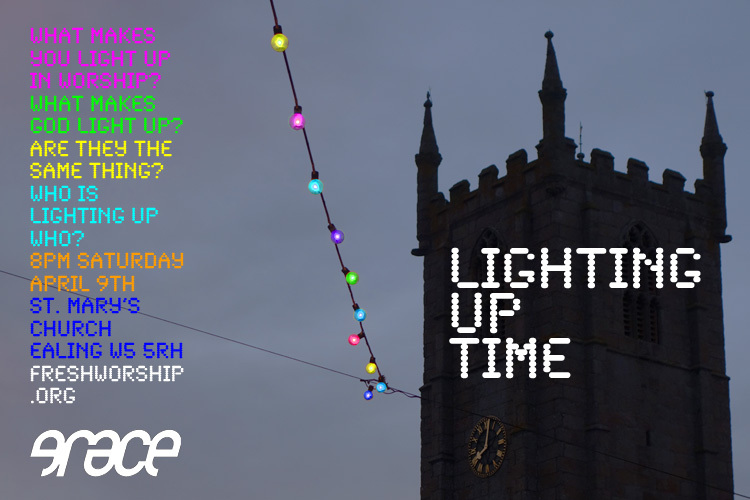 Let your little light shine at Grace - all welcome. This is a cafe format service so drinkable contributions will be appreciated to assist us in lighting up. There will be no Grace as such on March 12th. Instead we encourage you to see 'The Devil's Passion' (see below for ticket information). Grace will be running the cafe after the play, from 9pm to 10.30pm, and we would be delighted to see you then for drinks, nibbles and conversation. A theatrical event hosted by St. Mary's in the church. This will be a ticketed event £10/£5, book online here or for telephone bookings ring 0800 411 8881. Grace will host a cafe in the Polygon after the event. This would normally be a Grace service. 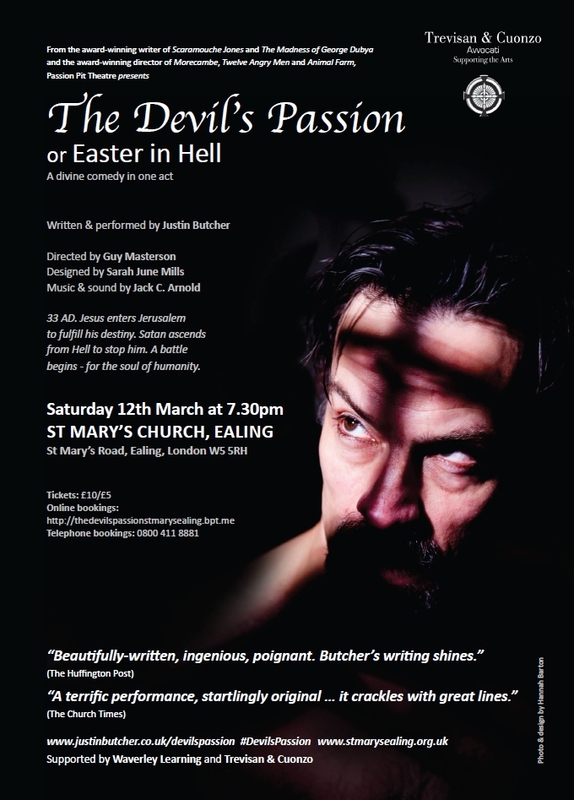 However, St Mary's are hosting a theatrical production 7.30-9pm in the church - The Devil's Passion by Justin Butcher. This will be a ticketed event £10/£5, see St Mary's website for booking details. Grace will be running a cafe space at 9pm in the Polygon after the event, for ourselves and for the audience. 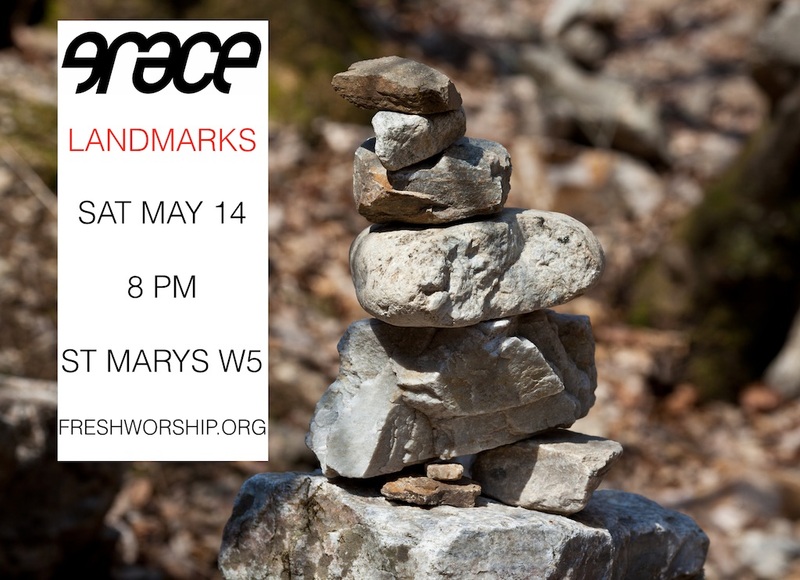 There will not be a Grace service as such, but we will probably run the 'Grace TV' video wall and we encourage you to come and hang out even if you don't want to see the performance. Discussions are based around 40 Temptations by Ian Adams. 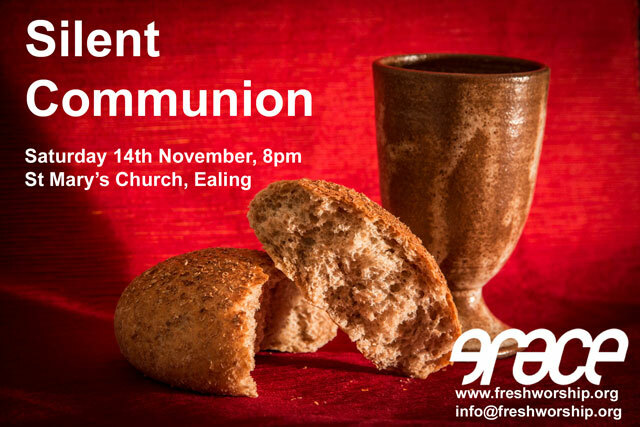 Please feel free to come along to any or all of the above - however it will help with the catering if you can email us beforehand at info[at]freshworship[dot]org. A communion-by-numbers for Lent. Not a Bowie tribute service but we couldn't resist the reference! This Saturday join us at Grace from 8pm in a café style service. 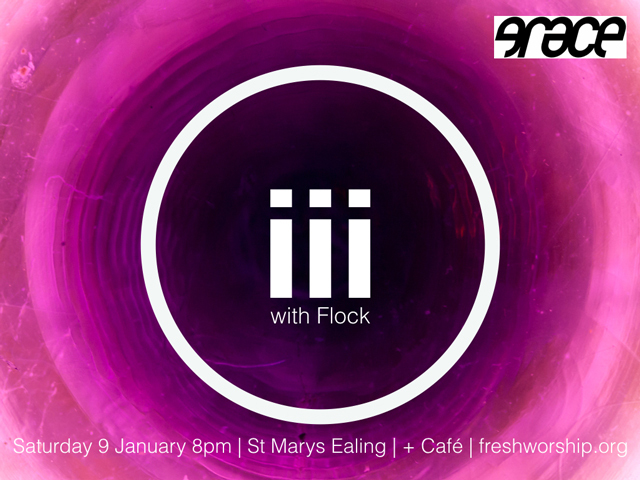 iii will be led by Flock (aka Chris Read and Harry Baker) with their unique contemplative blend of music and spoken word reflections interspersed with pauses for prayer. What better way to start the year? 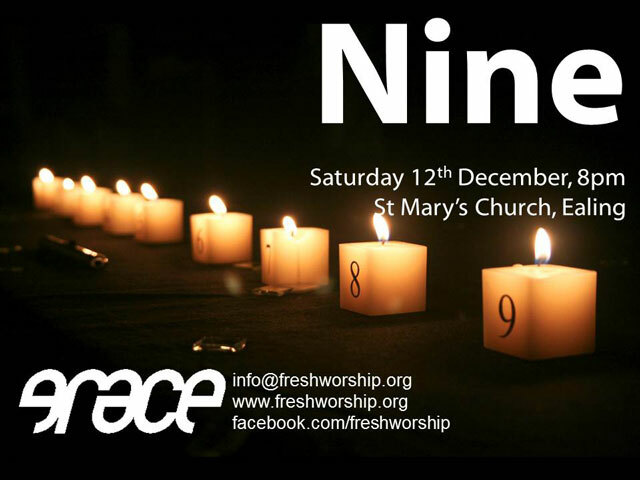 Our annual advent service based around the nine lessons and carols. Come and join us as members of the community lead us with their interpretation of one of the readings. An experiment in worship - If communication goes beyond words and speech, how do we reach out to others and God and can we extend our ways of worship? Who are your greatest influences? Spiritual, secular, contemporary, ancient? 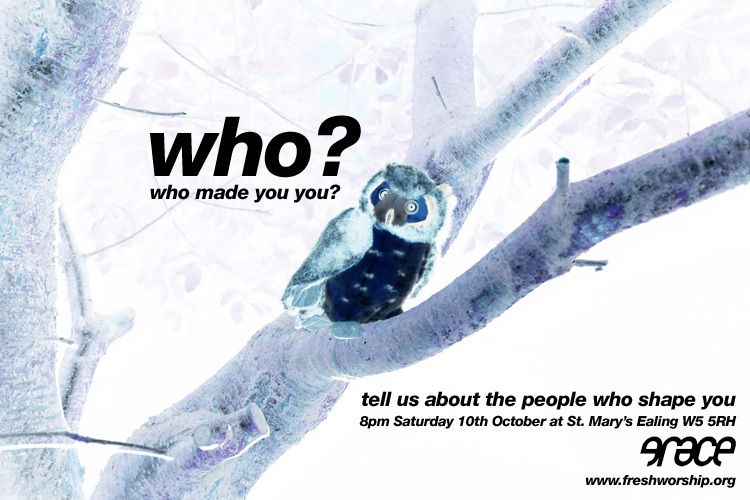 Who made you you? Come and discuss them over food and drink in the Grace café. Maybe we can swap influences, find new people to look up, new angles on those we already thought we knew. All welcome. 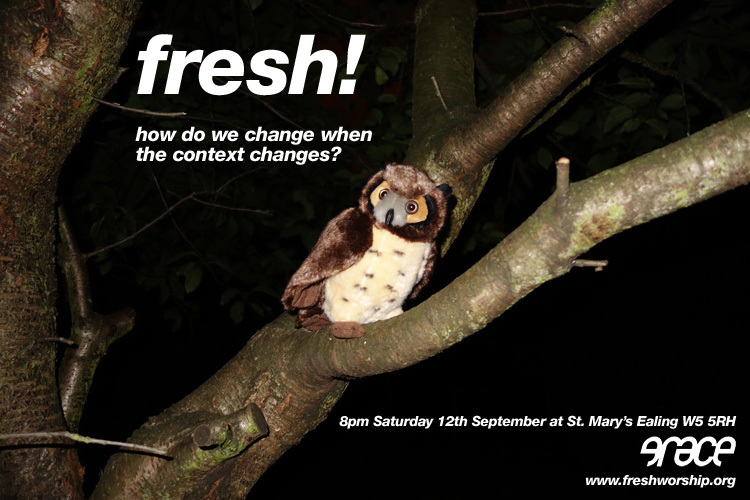 What should we change when our context changes? How do we honour the past while speaking to the future? How do we speak when our words have changed their meanings? Have you ever seen a real owl? Welcome to the new Grace website! We apologise for any other glitches, such as links that don't lead anywhere yet, and unsatisfactory bits of typography, which we will sort out in due course.